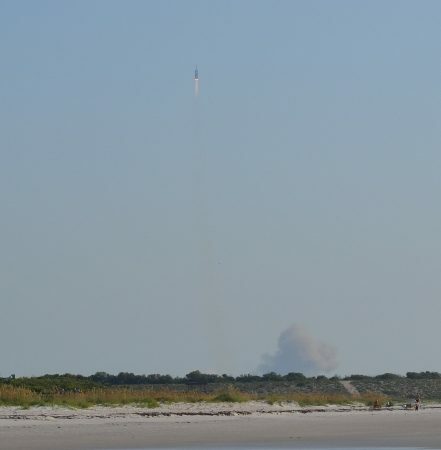 CAPE CANAVERAL, Florida -- A United Launch Alliance (ULA) Delta IV Heavy rocket carrying a payload for the National Reconnaissance Office (NRO) lifted off from Space Launch Complex-37 here at 9:15 a.m. EDT today. Designated NROL-15, the mission is in support of national defense. "Today's successful launch of the NROL-15 mission is the third of four launches for the NRO this year and the second EELV launch for the NRO in just nine days," said Jim Sponnick, ULA vice president, Mission Operations. "We congratulate the combined NRO, U.S. Air Force and ULA team along with our mission partners for their continued focus on mission success as we deliver the critical capabilities to support the soldiers, sailors, airmen and Marines." This mission was launched aboard a Delta IV Heavy configuration vehicle, which featured a center common booster core along with two strap-on common booster cores. Each common booster core was powered by an RS-68A Liquid Hydrogen/Liquid Oxygen engine producing 797,000 pounds of thrust. A single RL10 Liquid Hydrogen/Liquid Oxygen engine powered the second stage. The booster and upper stage engines are both built by Pratt & Whitney Rocketdyne. The payload was encased by a five-meter diameter (16.7-foot diameter), 65-foot, metallic tri-sector payload fairing. ULA constructed the Delta IV Heavy launch vehicle in Decatur, Ala. This was the inaugural flight of the RS-68A engine, which was upgraded from the RS-68 under the Heavy Upgrade program for the Delta IV Heavy configuration. With the RS-68A engine upgrade, the thrust has been increased from approximately 758,000 pounds to 797,000 pounds and the engine overall efficiency (specific impulse) has also been increased. "The upgraded Delta IV Heavy vehicle was developed with an extremely thorough and comprehensive system engineering process by the ULA and Pratt-Whitney Rocketdyne teams, along with substantial involvement by our U.S. government customers," said Sponnick. "Congratulations to the entire team on today's successful inaugural flight of the upgraded Delta IV Heavy launch vehicle and the RS-68A engine." Commercially developed in partnership with the United States Air Force to provide assured access to space for Department of Defense and other government payloads, the Evolved Expendable Launch Vehicle Program supports the full range of government mission requirements, while delivering on schedule and providing significant cost savings over the heritage launch systems. ULA's next launch is the Atlas V NROL-36 mission for the NRO scheduled Aug. 2 from Space Launch Complex-3 at Vandenberg Air Force Base, Calif.